01-02-2017 : TNPSC Annual Planner for the year 2017 is published in the TNPSC Website. According to the news accessed from tamil.thehindu.com website, the Annual Planner Preparation work is going on. Vacancies announced in the last year Annual Planner for TNPSC Group 2 Interview and Group 2A Non Interview Posts also will be added into the upcoming Annual Planner. So vacancies will remarkably increase. All the best ! According to the news, there will be about 15000 vacancies in the upcoming annual planner. TNPSC has informed that 70 % of the postings were received from the various departments and the remaining posts also expected to be received with in the first week of January 2017. The Anual Planner is expected to be published with in 15th of January 2016. 4th week of Sep. 2016. 25-01-2016 : TNPSC Annual Planner 2016 - 2017 to be Published soon - TNPSC Chairman Informed. In a official visit at the TNPSC Group 2A Exam Centre at chennai, the Tamilnadu Public Service Commission's Chairman has informed that the preparation of TNPSC Annual Planner 2016-2017 works are going on. The Annual Planner is to be published with in one week. 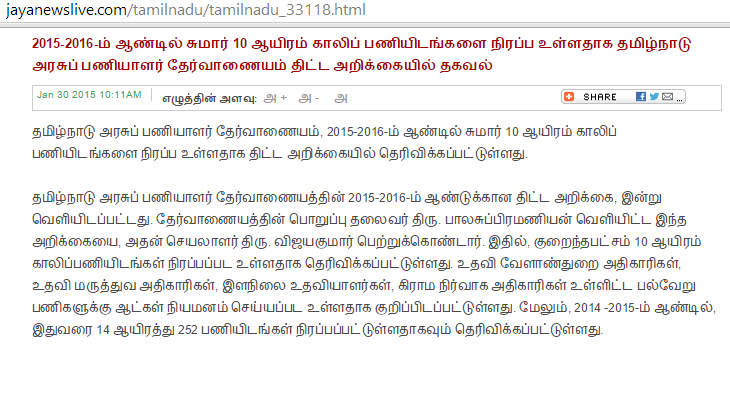 12-10-2015 : TNPSC Group 2A Non Interview Exam 2015 Notification Published Today. Total Number of Vacancies 1863 . Exam Date : 27-12-2015. 07-04-2015 : TNPSC Exams 2015 vacancies to be increased - TNPSC Chairman informed. 30-01-2015 : TNPSC Chairman Released the Annual Planner for the 2015 - 2016 years. According to news sources, there are about 10,000 vacancies in this year annual planner. The vacancies includes Group 1, Group 2, Group 4, VAO, Assistant Agricultural Officers, Junior Assistants, Village Administrative Officers, etc. Tamilnadu Public Service Commission (TNPSC) is conducting TNPSC Group 1 , Combined Engineering Services Exam, Group 2, Group 2A, Group 4, VAO etc. for filling up vacancy position in various departments of the Government of Tamilnadu. Usually, TNPSC publishes Annual Exam Planner in the first month of every year. This year also, TNPSC is to publish the annual planner of various examinations. The details like tentative notification date, date of written examination and tentative result date will be included in the TNPSC Annual Planner. Today (30-01-2015) at 11 am the annual planner is expected to be released by the respected TNPSC Chairman at the TNPSC Office. Updated on 28-01-2015 : TNPSC Annual Planner or Tentative Schedule of Exams in 2015-2016 to be published on 30-1-2015 - TNPSC Chairman Informed. TNPSC Chairman informed in a press meet at Chennai. He also informed that the TNPSC Group 1 Preliminary Exam 2014 Result also to be published with in 12 days.